[This article appeared in Musical Celebrities (second series), by F. Forster Buffen, London, Chapman & Hall, 1893, pages 61-64. Par 1 AS an appropriate companion to the biographical sketch of the famous Russian virtuoso, Vladimir de Pachmann, I have now the pleasure of submitting that of his gifted and beautiful wife, whose personal graces and musical capabilities have combined to make her one of the most popular and attractive pianists of the present time. Par 2 Marguerite de Pachmann, née Maggie Oakey [Okey], was born in Mudgee, New South Wales, on the 15th [14th] of December, 1864. Although she actually began to learn the notes on the piano at the age of two, she only received her first lessons from the organist at St. Leonards in 1869. About this date her family migrated to the Mother Country, and at seven years of age the young artiste having played with great success at an entertainment given at the Queen's Concert Rooms, Hanover Square, it was decided to give her the advantage of a thorough musical education, and she accordingly entered the London Academy of Music, and remained there several years, studying the piano under the late Dr. Henry Wylde [1822-1890, founder of the Academy], and harmony and composition with Ferdinand Praeger [1815-1891]. Upon leaving the Academy she played first at the Crystal Palace, then at the Covent Garden Promenade Concerts, subsequently undertaking several provincial tours, which were attended with considerable success. Par 3 This favourable promise was destined to receive an important impetus, indeed its ultimate fulfilment, p.62 from an event that occurred shortly afterwards. In 1882 she happened to be present at St. James's Hall when M. de Pachmann gave his first recital in this country. The performances of this renowned, and in some respects unequalled, pianist furnished the turning-point in her career, and created a revolution in her treatment of the instrument. Par 4 Surprised and delighted at the impassioned yet perfect art displayed by the Russian artist, she at once wrote and asked him if he would receive her as a pupil. Similar requests were made to M. de Pachmann by a number of English ladies, which, however, were refused on the ground that he had at all times declined the drudgery of instruction. Par 5 Shortly after this, however, M. de Pachmann attended a concert at St. James's Hall, at which Marguerite performed a Concerto by Chopin; and so satisfied was he with her interpretation of the Polish master's work that at the termination of the concert Pachmann went into the artists' room and congratulated her, the praise bestowed being mingled with criticisms which appeared to the young artiste somewhat severe and disappointing. Marguerite took the opportunity to remind him of her wish to become his pupil, and hearing her subsequently in private, he at length consented to initiate her into the secrets of his system. Par 6 In October, 1882, therefore, Marguerite went to Germany, and placed herself entirely under the direction of her exacting master. The system of M. de Pachmann, which he claims to be peculiar to himself, demanded a renunciation of the Academy traditions; and for the first six months she was permitted to play only five-finger exercises, and was frequently compelled to practise on one note in order to obtain every variety of touch and gradation of tone. Par 7 For the next eighteen months Marguerite submitted to this vigilant course of supervision, at the p.63 end of which period the relationship of master and pupil became merged in that of the more congenial alliance of man and wife. Par 8 The first years of Madame de Pachmann's married life were spent in visiting the various countries in which her husband fulfilled his numerous engagements. 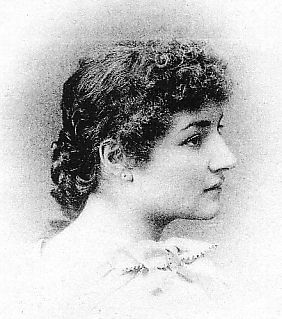 This gave her the further opportunity of observing his method and style, and in 1887, after an absence of five years, she reappeared in public at the Philharmonic Concerts, Berlin, as to which the Vassische Zeitung of February 9th remarks: "The chief characteristic of Frau von Pachmann's playing is tenderness. She performs nimbly and neatly, and with keen intelligence. The gentle and agreeable tone summoned at her touch clings caressingly to the ear. Her reward on this occasion was the heartiest applause of the audience." Par 9 After the concert the Princess Royal went to Marguerite in the artists' room and invited her to the Palace, this being the first time this honour was conferred upon an English artiste. Par 10 Interesting and successful tours were then made throughout Russia and Denmark, the Queen of Denmark bestowing special marks of favour upon this accomplished woman. It frequently happened that the Queen, who is an admirable musician, would send for her to spend the morning in playing with her duets upon two pianos, and many were the beautiful presents bestowed by Her Majesty upon Madame de Pachmann as souvenirs of the Queen's appreciation of her artistic performances. Par 11 Marguerite revisited London in 1888, and the following account of a recital given by her at Prince's Hall appeared in The Daily Telegraph : "Amateurs interested in the artist's fortunes recognised, after a glance at the programme, the thoroughness of the trial to which she proposed submitting herself, and attended in large numbers to witness the making or p.64 the marring of a conscientious and earnest student upon whom rested great hopes. Madame de Pachmann, we hasten to add, passed through the ordeal triumphantly; commending herself more and more to the audience as the recital proceeded, and ending with the status of a pianist in the higher ranks of her profession." Par 12 In 1890 Madame de Pachmann undertook her first tour in America, where she played at a series of concerts extending over two months. This country was revisited in February, 1892. Of her appearance at Chickering Hall, the New York Tribune writes: "Madame Marguerite de Pachmann, the wife of Vladimir de Pachmann, the great Chopin player, made her first appearance in this country at a concert last night in Chickering Hall. Madame de Pachmann is a worthy artistic mate to her husband, and she scored an instantaneous success with her audience. The occasion was an orchestral concert given under the able direction of Mr. F. Vander Stucken [Frank Van der Stucken, 1858-1929], in which the Pachmanns were the soloists." Par 13 Madame de Pachmann has also acquired renown as a composer, and two graceful pieces for her favourite instrument have been published, entitled, "Thème et variations," and "Reverie du Lac," but other compositions have issued from her pen of a more classical character, among them being a violin and pianoforte Sonata, in which her real love of the art and knowledge of the science of music is fully displayed. Par 14 Paris is the abiding place of this young, gifted, and beautiful Englishwoman, who is now only in the beginning of a career which promises unusual artistic brilliancy in the future.